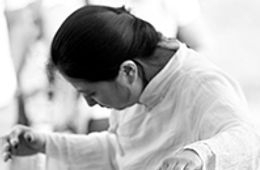 "Mountain, Water, Sentiments -- Traditional Chinese Zheng Masterpieces Performed by Haiqiong Deng"
"Echoes of Strings - Classical Indian Music by Sitar and Zheng"
Haiqiong Deng is a performer of the traditional Chinese instrument, zheng (or guzheng). 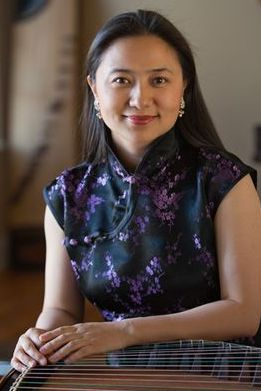 She was the recipient of 2018 Florida State University College of Music Research Fellow, the 2017 Florida Cultural Heritage Award, the 2013 Florida Individual Artist Fellowship, the Master Artist of the Florida Folklife Apprenticeship Award in 2012, and the winner of the Outstanding Performance Prize at the 1995 Chinese National Zheng Competition in Shanghai. Both her CDs, Mountain, Water, Sentiments: Traditional Chinese Zheng Masterpieces Performed by Haiqiong Deng and Stringing Echoes: Classical Indian Music by Sitar and Zheng were nominated for the 13th Annual Independent Music Awards in “World Traditional” Category in 2014. Haiqiong Deng made her professional début in Beijing in 1997. Since that time, she has developed an international reputation as a zheng soloist and a chamber musician, performing throughout China, Canada, Japan, Singapore and the North America. She has performed with Music from China (New York City), Third Angle New Music Ensemble (Portland, OR), the Orchid Ensemble (Vancouver), Singapore Chinese Orchestra, Singapore City Orchestra, Singapore Symphony Orchestra, Tallahassee Symphony Orchestra, and attended various music festivals as well as given numerous performances and lectures at universities, museums, and national/regional conferences in North America. Her Carnegie Hall début recital in 2003 included two world premieres: Dots, Lines, Convergence by Chihchun Chi-sun Lee, a concerto for zheng and chamber ensemble commissioned by the Harvard Fromm Foundation, and CRUSH, a duo for zheng and soprano saxophone by Michael Sidney Timpson. Haiqiong actively promotes new music for the zheng. Composers she has worked with include Chihchun Chi-sun Lee, Michael Sidney Timpson, Zhou Long, Chen Yi, Ye Xiaogang, Moshe Denburg, Mark Armanini, and Cristian Marina. CDs from these collaborations include Concerto for Strings with Percussion Orchestra with the McCormick Percussion Group (Ravello Records 2012); Life Death Tears Dream with the Orchid Ensemble (2012); Elegance: Music of Chihchun Chi-sun Lee (Glorious Pantheons, Chiayi, Taiwan, 2008), nominated for Golden Melody in Taiwan 2009; Tales From the Cave: Music from China (Delos International 2004); Cross-Cultural Collisions, Reinventions & Fertilizations: the Compositions of Michael Sidney Timpson (Capstone Records 2008); and Oriental Landscapes: Evelyn Glennie with the Singapore Symphony Orchestra (BIS 2002). Other world music traditions also frequently influence Haiqiong's music. She expanded her musical expression through collaboration with the Indian sitarist, Nalini Vinayak. This lead to the 2011 release of a CD that, for the first time in history, combined Chinese zheng, Indian sitar, and tabla on classical Indian Music: Stringing Echoes: Classical Indian Music by Sitar and Chinese Zheng (nominated for the 13th Annual Independent Music Awards in the “World Traditional” category) by Trible Records. Haiqiong's composition, Layered Fantasy: for Indonesian Gamelan and Chinese Zheng, also unites these two music traditions for the first time in history. It was premiered on March 28, 2014 at the Florida State University. Her other two cross-cultural compositions, "Kora" for Omnimusica Intercultural Ensemble (2018) and "Rock the World: the Power of Powerful Music" (2018), were also premiered at the FSU Rainbow Concert of World Music in 20118. In addition to the zheng, Haiqiong also excelled in qin (guqin) performance, having studied with masters Gong Yi and Lin Youren. The qin is a key element in the inner cultivation of her mind. Together with Dr. Nan Liu, Haiqiong created the group “Echoes of Nature” to promote traditional Chinese music, calligraphy, and painting. The group has given numerous lectures, live demonstrations, and stage performances at museums, universities, K-12 schools, and festivals around the United States. Haiqiong is the featured zheng artist in the chapter on Chinese music in the widely used textbook World Music: Traditions and Transformations (McGraw-Hill, 2007), by Michael B. Bakan, Professor and Head of Ethnomusicology and World Music at Florida State University. In addition to extensive coverage of her music, life, and career in the text itself, she is also featured on four of the tracks included on the book's accompanying 3-CD set by Sony BMG Music Entertainment and on the online Musical Guided Tour for the chapter. Haiqiong received her Bachelor of Music degree in zheng performance from the Shanghai Conservatory of Music and Master of Arts in Arts Administration and Ethnomusicology from the Florida State University College of Music. She is currently the Director of the Chinese Music Ensemble at the Florida State University and a Ph.D. Candidate in Musicology at the Florida State University.